Yesterday I was completely inspired when I spied these cookies from Fancy Flours and decided to make them then and there! I didn't have their bunny ear cutters of course, so made my own template. I immediately imagined a glass of milk as a white bunny, and using markers to make a simple bunny face:) I also dressed the ears up with royal icing. I had so much fun on this cookie project and was tickled with the results! I made the template by cutting out some bunny ears (4.5-inches x 2-inches, at widest part) freehand from a file folder. I got the glass(es) I was going to use from the cupboard and fiddled with the template (especially the notches) until the ears fit correctly on the glass rim, and stayed upright. From there I rolled out the sugar cookie dough fairly thick (3/8-inch). 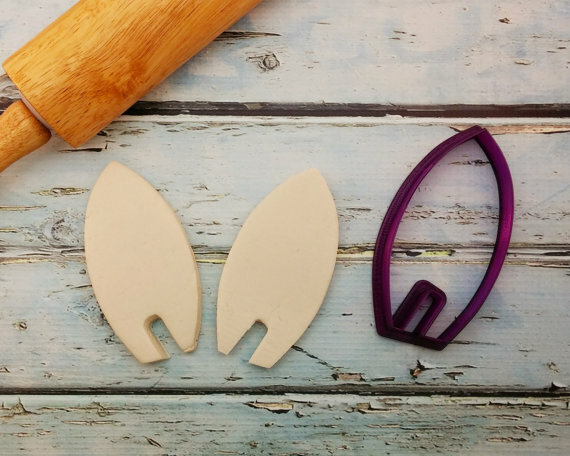 I placed the templates on the dough and cut around them with a small, sharp knife, then transferred the cut-outs to the baking sheet. Before baking, I placed the baking sheets into the freezer for 10-15 minutes to hold the shape, particularly the notches. Even so, immediately after baking I used the small, sharp knife to cut into the dough to make the notches more pronounced and precise. Let the cookies cool completely and then decorate with royal icing. Outline the ear in white (see middle photo) and let that dry for about 15 minutes before filling in with white, thinned royal icing. Allow to dry for about an hour. Do the same with the pink icing, and let dry overnight, if possible. For the faces, simply use a dry erase marker, or Sharpie (It washes off easily with soap), to pen a cute bunny face. Pour in enough milk* to make your bunny faces:) Place the ears carefully on the rims of the glasses. If they fit too tightly (or don't quite fit), use the small, sharp knife and gently scrape the inside of the notches for a better fit. 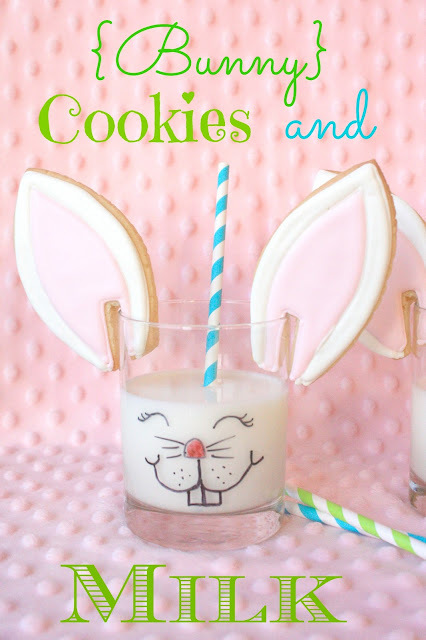 Drink your milk, dip your bunny ears in the milk, nibble (as bunnies do) and ENJOY! Now, instead of making your own template, you can purchase a cutter (based on this design) from Bobbi's Cookies and Cutters, right HERE! You constantly amaze me Sue!! Super cute!! Sue! They are absolutely adorable and so much fun. My boys would love them. Beyond adorable! I can't stop admiring those ears.....and the glasses too!!!! I just love these they are adorable!!! You have outdone yourself....again, Sue. These are absolutely the most adorable easter treat. Sue! So darn cute! You are amazing, once again. My kids would LOVE these!!!! Good heavens, that just topped the cuteness chart! You are so creative, Sue!! One of the cutest cookies I've seen..... Evvva! Oh my goodness!!!! Way too cute!!!! Absolutely ADORABLE!!!!!! I have pinned! BTW, you are welcome to From Dream To Reality whenever you would like! That is one of the most clever ideas I have seen yet. Adorable!!!!! Thanks for sharing at For the Kids Friday! Love, love, love it!!!! Absolutely love this! Such a cute Easter snack idea. Stopping by from the hop. Hope to see you at True Aim! Oh my, the ears, the face, everything is just as cute as can be! How adorable, Sue! You are truly an artist! what a coooool post and cooler blog!!! congratulations on your originality Sue!! you've got a new fan for sure!! You are killing me!!! these cookies are amazing, the most incredible idea! I love so much everything you do. oh wow this is a great idea! ingenious! i hope someone does the chocolate milk/brown bunnies idea you mentioned too, id love to see that. This is so so cute!! I would have absolutely love this as a kid. These are absolutely adorable and incredibly clever. Pinning. Hi Sue I am very happy that you participate in "Voglia di....Easter"
Can I ask you to insert the picture of the bunny cookies inside shared board on Pinterest? I sen you the invitation. I'm excited, thanks again my dear. LOVE THESE!!! I'm not just sure how you made your own template...please fill us in, otherwise I have no idea how I would make them. What an adorable idea. Your posts always make me smile. You've done it again Sue!!! ABSOLUTELY ADORABLE!!! You are a cookie genius! No way! These are so wonderful and adorable! Once again, you've outdone yourself! Those cookies are as cute as can be. I have no words for how cute this idea is! These are totally adorable! I absolutely love them and think they're perfect for the season. So, so cute! Love this! Oh my word! This is the cutest cookies and milk I have ever seen!!! How adorable!! You are just so creative Sue. I really love your idea. I would definitely use this idea to make my kids love milk. I am sure their attention will be directed to the cute bunny ears. It is amazing that it can be done in a simple manner and would not eat up much of my time. This is really something that moms like me can just use to attract kids to eat. Absolutely replacing the traditional stand-up bunny cake (ya know, the one made with 1 round cake pan & paper ears) with this for our fun Easter dessert. Such a great idea...well done! I am featuring YOU and this FABulous idea at this week's For the Kids Friday link party! Thanks so much for sharing at Sun Scholars! You are awesome!!! Sue, these are so creative and pretty, not to mention cute! They've been featured on todays Sugar & Slice Sunday. Thanks for linking up. What a fun idea! And wonderful for a kid's Easter party! I just discovered your blog and it is fantastic. You are so creative. I actually discovered your blog via a post on I am Baker, and I was upset on your behalf when I heard that someone had stolen one of your posts and added it as their own to a Facebook page. I just don't understand how someone could do this and think it is OK.